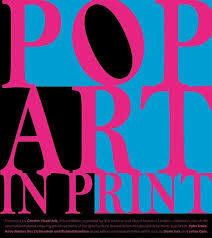 Chester Visual Arts has had a free exhibition of 1960s Pop Art prints from the V&A collection on since the end of July. It finishes on Sunday and today, the Cheshire Art Fund had organised a pop up lecture on Pop Art by Adrian Sumner. This was a good excuse to get on the train and learn a little more about it. We had visited the Andy Warhol Museum in Pittsburgh last summer but my art studies at school did not venture beyond the end of the 19th century and a lot of the modern art I have studied since has been abstract modernism. The exhibition was of prints with some textiles and wallpaper. Photography was not allowed. After a bit of shopping, I returned for the lecture. Adrian covered a lot of material. I learnt that Eduardo Paolozzi produced some early Pop Art in the 1940s and 1950s. I know him mainly for his later sculpture (and looked after some of his relatives when I worked in Edinburgh 30 years ago) so it was interesting to discover some of his other works. Adrian took us through from the earliest days to modern artists in both Europe and the USA. As he has been a lecturer in art I was a little surprised that he went on for over 75 minutes (I left before the end at this point) and did not encourage audience participation. Outside on Northgate Street there are some three dimensional works. 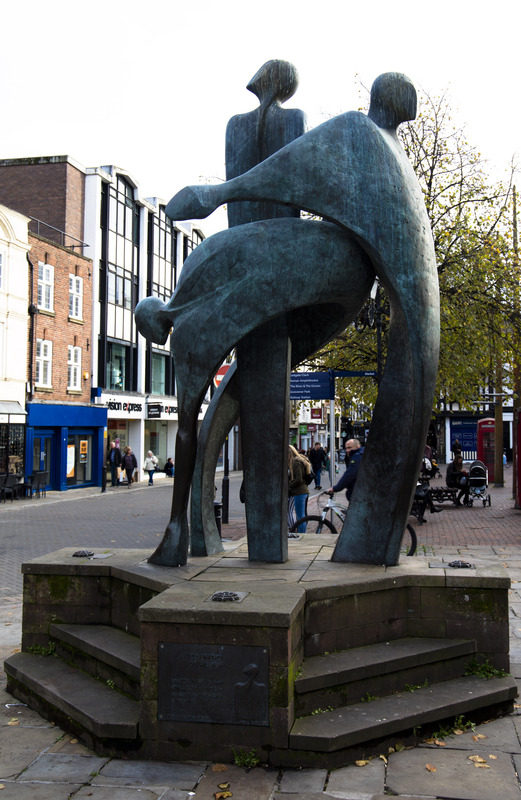 This sculpture was installed in 1992 as a celebration of Chester’s 900th anniversary celebrations. 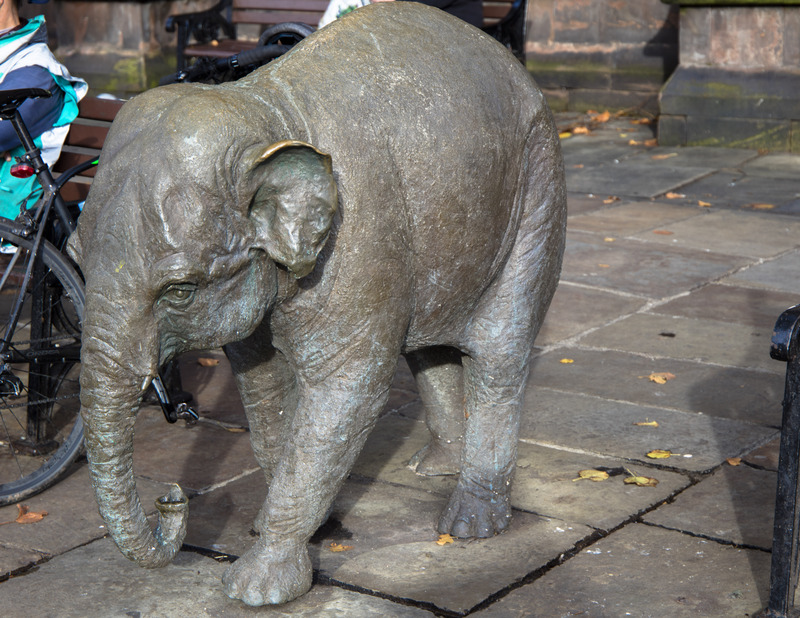 There was also this baby elephant called Janya which means ‘life’ in Hindi sculpted by Annette Yarrow in 2010. She grew up in India in the 1930s and 1940s and this sculpture was a gift to the city from the zoo. It chimed with my interest in natural history because the other day I was reading something which said that while there are clear morphological differences between Asian and African elephant (including ear size), it has now been discovered that there may be at least two species of African elephants, the Savanna Elephant (Loxodonta africana) and the Forest Elephant (Loxodonta cyclotis) which look the same and are only distinguishable by DNA. A third species, the West African Elephant, has also been postulated. 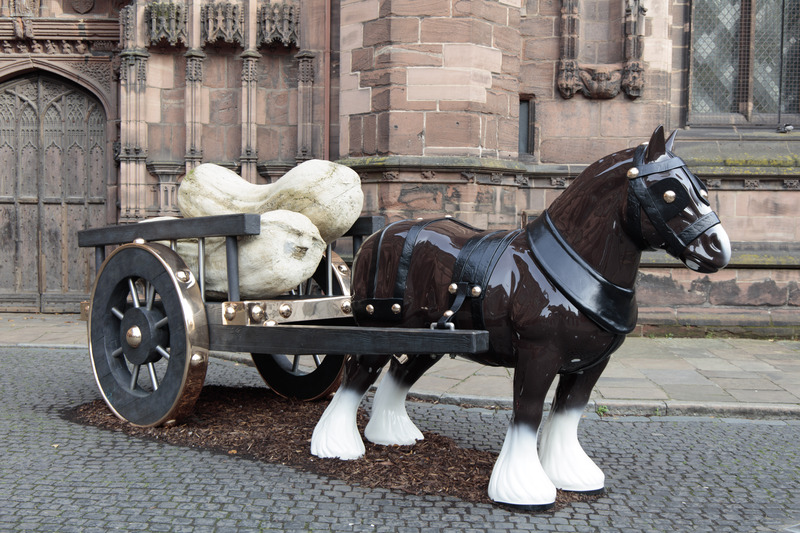 On our way back to the station, we passed the cathedral which had this installation outside. There was no notice to explain what it was and who created it and we did not have time to go inside and find out as we had a train to catch. I have used my art fund pass a lot, although this was the first local event I had been able to attend and they have been able to fund numerous artworks for the nation. Chester Visual Arts aims to establish a permanent contemporary arts centre in Chester and I wish them luck.